ZZ Top and guitar legend Jeff Beck have inked a series of late summer dates together. 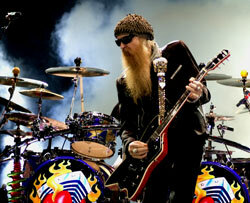 The first-ever tour pairing has Top guitarist Billy Gibbons psyched. Billy says, "Ever since experiencing 'Jeff's Boggie', the prospect of performance with Jeff Beck on the deck brings us into focus with the curator of crunch". For his part, the Yardbirds and Jeff Beck Group string slinger says he can't wait to get together on stage with Billy, who he declares is 'The Professor of Grunge'. The Top and Beck have combined forces on a couple of previous occasions. The performed Foxey Lady and Rough Boy together in 2009 at the Rock Hall Of Fame 25th Anniversary Concert in Madison Square Garden in 2009 and Beck hopped on stage in Italy during a 2010 ZZ Top concert to help them crank out La Grange.